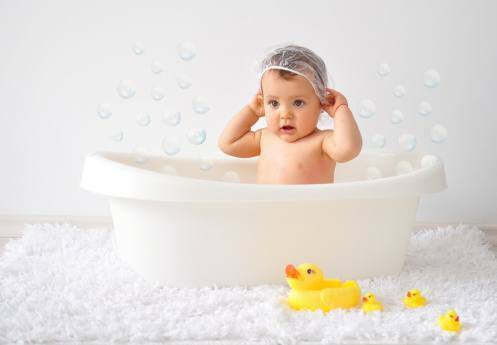 Make bath time fun by finding a baby bath wash product your child will love. Use our comparison table below to get started. Canstar Blue research finalised in May 2015, published in July 2015. Johnson’s baby wash secured our Most Satisfied Customers Award with a five-star rating for overall satisfaction scoring strongly for effectiveness of clean, lack of irritation, good bubbliness and possessing a lovely smell. When you’re giving your baby a nice relaxing bath, you want nothing but the best bath wash products to ensure your young child is getting the safest wash possible. That’s where baby wash comes in: special body wash products that are formulated to be gentle on the delicate eyes, skin and hair of young children. Of course, this begs the big question: of all these products which claim to be the best for your baby, which ones are parents most satisfied? 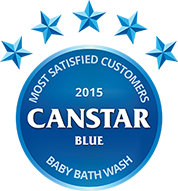 Here at Canstar Blue, we’ve utilised the opinions of thousands of Aussie customers to track satisfaction with a wide range of products. We asked Australian parents how satisfied they were with their baby bath wash based on criteria like value, gentleness, cleaning effectiveness and more, and we’ve found one brand that really is outstanding: Johnson’s baby wash has secured our Most Satisfied Customers award for 2015 with a five-star rating for overall satisfaction. The brand improved on its four-star rating the previous year, whilst previous winner Ego QV scored four stars along with Curash and Gaia; our final rated brand was Aveeno, which secured three stars overall. There were some strong individual performances across our criteria, with multiple brands achieving the maximum five stars – read on to find out how they all fared. Whilst your baby’s health is the number one priority, you have to consider the value of your purchases when you’re churning through bottle after bottle of baby every month. The customers we talked to were most satisfied with the value offered by Curash, with the brand achieving a five star rating. The trio of Johnson’s, Ego QV and Gaia all scored four stars and Aveeno scored three to complete a competitive field on the pricing front. An effective clean is, of course, the entire purpose of using a baby wash product, and was by far the biggest contributor to overall satisfaction. All five of our rated brands returned from the cauldron of public perception with excellent results: there were an impressive three five-star ratings for Johnson’s, Curash and Gaia, as well as two four-star ratings for Ego QV and Aveeno. Clearly, there’s no lack of effective products in the baby wash market. A product that doesn’t irritate your baby’s eyes will also be gentle on their skin, face and head, and being non-irritating is pretty much essential for products that are tailored for infants. In a repeat of the previous metric’s results, it was Johnson’s Curash and Gaia which all returned excellent five-star results for satisfaction. Ego QV and Aveeno played runner-up with four stars to complete a high-performing field when it came to mild, non-irritating bath wash.
A significant 44% of the parents we talked with admitted to using their child’s bath wash themselves, and a big factor in that is no doubt how lovely it smells. A pleasant scent does wonders for making bath time an enjoyable experience for you and your baby, and our rated brands didn’t disappoint. Johnson’s and Gaia both received outstanding satisfaction ratings to top the scent scored with five stars; behind them were four-star achievers Aveeno and Curash, as well as Ego QV with three. Something not as important, but great fun nevertheless! Bubbly bath wash makes things much more enjoyable for toddlers splashing around in the bathtub, so it’s great to know which brands will provide the most entertainment. It was overall winner Johnson’s which scored five stars for bubbliness, beating second-placed Curash, Gaia and Aveeno – all on four stars. Ego QV scored just two stars, suggesting they weren’t as committed to the bubble phenomenon. Bubble quantity is nothing without bubble longevity, and Johnson’s topped the satisfaction scores when it came to duration as well. Gaia and Aveeno repeated their four-star ratings for the duration of their bubbles, whilst Curash achieved three stars and EG QV two stars. Canstar Blue commissions Colmar Brunton to survey 1,300 Australian consumers across a range of categories to measure and track customer satisfaction. The outcomes reported are the results from customers within the survey group who have purchased or used baby bath wash within the past 6 months – in this case, 837 Australians. Your baby's skin is delicate, so know what you're bathing them in. We take a look at what Aussies are looking for when they choose a bath wash for their little one. Many parents love bath time with their baby, but how can you make it even more enjoyable for the both you?